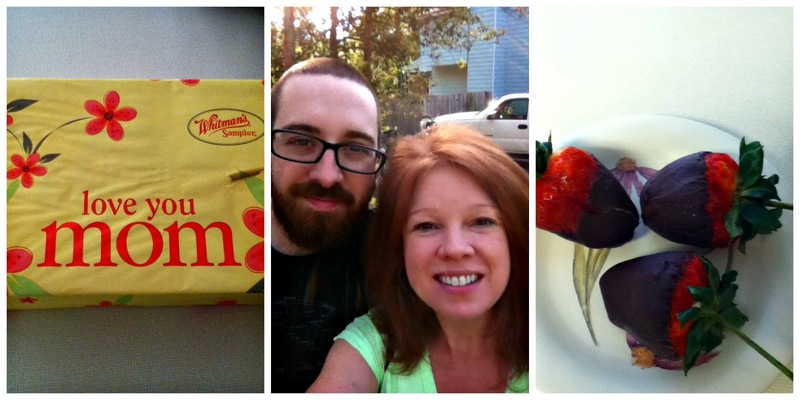 I was able to wrap up May with 10 supersonic miles...okay, not really I manged a 10:30 average pace. Maybe if I stop spacing long runs so far apart I will feel stronger. Run buddy is recovering from the flu so she came and ran the first hour with me, which really helped the time to go by fast. I do enjoy the 4 x 1 because it's nice to enjoy the walk break together. I finished about 9 a.m. and even with sunscreen I still got a bit pink. I really don't like getting any sun, so I guess I am going to have to work on earlier than 7 a.m. on weekends. I like to sleep though! I am begrudgingly getting use to running with my hydration pack, but I still don't love it. It would be impossible, suicidal, irresponsible to not carry it though, I drank about a half liter today. I looked really rough when I got done. I sweated so much as the sun was getting stronger, I had to detour a few seconds and use a sprinkler to flush my eyes. They were burning from all the sweat...gross. I could not wait to shower! Since I am not really training for anything I just have a few big picture things. So far this year I only blew that goal twice. I had a week in February and one in March where I only got three workouts done. The rest of my miles were all in short runs. I am thrilled with my numbers this month, I rarely have 100 mile months, but oddly I didn't feel super strong most of the time. I would say the majority of runs I really had to work to keep moving forward, no smooth sailing feeling much; which is why I ended with a bunch of shorter runs. My diet and hydration have been fairly consistent, so the only thing I can figure is my lack of sleep is affecting my energy levels. I don't roll well with 6 or 7 hours a night and that happened on a very regular basis. I really need a few 9 hour nights a week to feel in tip top shape. ...and I accepted a new position working in an elementary school office, but I don't start till August. I work my current job until June 30th. What highlights did you enjoy in May? Tell me anything :) Are you excited to be heading into June? Sleep is better than medication for me. I require a lot of sleep and rarely get enough during the week. It was overcast and sprinkling today so I ran a quick 5K - it was pretty humid but I manged a decent pace. I will take this weather any day over the past few 98 degree days. This time of year at my house the shedding animals get out of control. I comb them and the clumps seem to be never ending. I vacuum and it's hair covered again shorty after. I am glad we are going out, I don't have to look at it for a little while. Misty is a pretty silver color till it gets all over my floor. This hasn't been a spectacular running week. My hubby's days off fell on Wednesday and Thursday so I tend to hang out with him and I've only run a total of 7.5 miles in this week...so far :) I did get a good hour of weight work in Tuesday. My plan is to Saturday long run. My gym boss arrived, I programmed it for 4 x 1, now I just have to get my legs to cooperate. 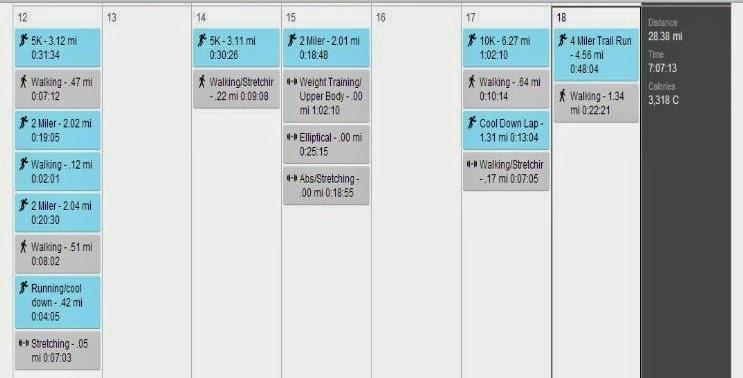 Hopefully I will have long run success to share with you ") My last long run was May 3rd, it was a 10 miler. My next longest distance this month has been 7 miles. I ran a lot of miles this month in shorter runs. Any fun plans this weekend? How much sleep do you need to feel good? Shedding animals making you crazy yet this season? Used Up - Rest or Not? Monday I woke up hungry and my legs and glutes were feeling used up after my hike. I love that feeling! It's hard to hit that perfect sweet spot of tired, when it comes to working out. I planned to work out since I was off work, but toyed with being a slug all day because I felt used up happy, but by afternoon I wanted to go the gym. My plan was an upper body work out. However, toward the end of my treadmill warm up I noticed the girls cleaning. They were closing an hour earlier than I expected...maybe I should have read the sign...so I did twenty minutes of stretching and headed home. Not quite the work out I wanted, but I did get an easy pace 35 minute run in and my legs felt surprisingly great. I need my nagging calf issue to be gone. Used up is good - the right amount of soreness in my muscles, a happy fatigue. Tight is on the edge - muscles feel strained, or usually there's a particular spot that is for sure irritated and on the edge of pain. When my left calf hurt the past few weeks, it ached even during casual activity, but would come and go. If I had to scale it 1-10, tight would be 3 or under for me. I usually try some rest, alternative activity, stretching, and ice. Constant pain or anything 6 or above will usually result in the a trip to the doc...eventually. Are your rest days always planned? or just happen when you've worked enough? Don't you love hitting the sweet spot? Sooo, the logical thing to do when you have a not so great run in the morning is to go run again at night, right?? After my Saturday morning trail run my legs were feeling tight all afternoon, so about 7 p.m. I went to the gym and hopped on the treadmill for a quick 5K progression run. I spent about 20 minutes really holding my stretches. Sunday I woke up and filled my three liter pack, eager to tackle some elevation. 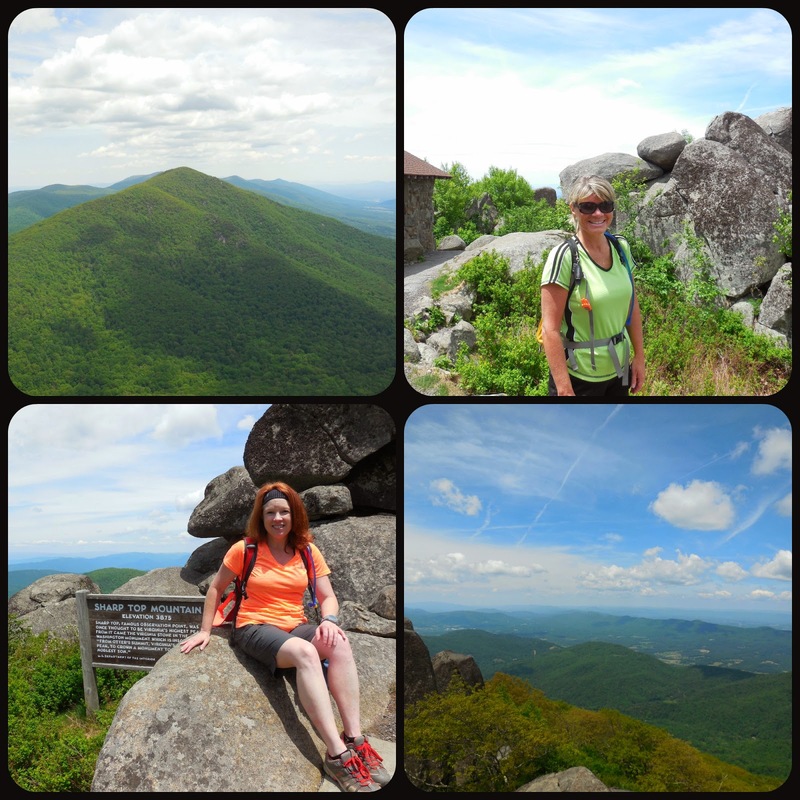 VA temps were perfect...(a rare thing) 80 degrees with a wonderful breeze, humidity below 60%...a picturesque day for a hike. It was a peachy day! 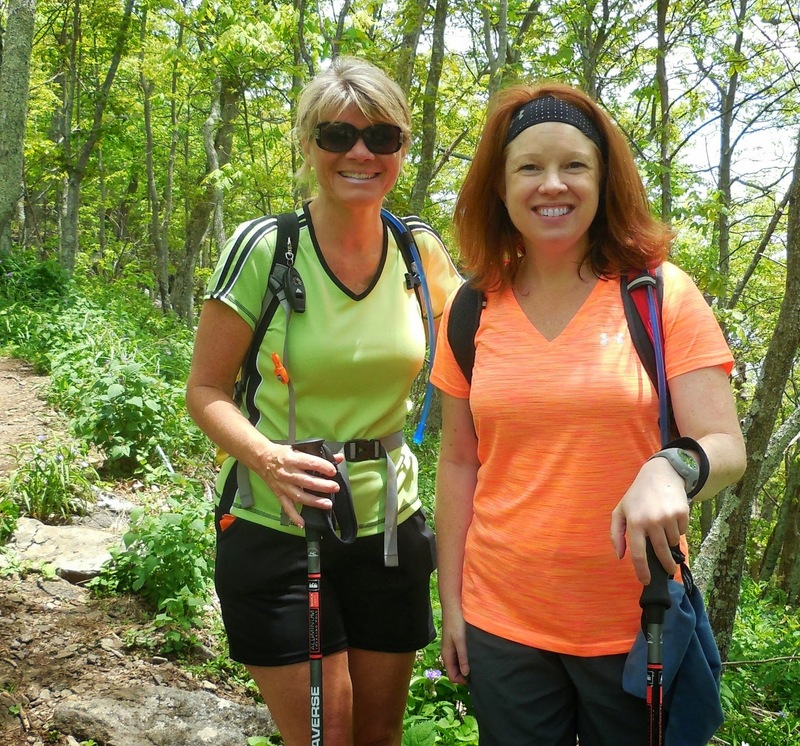 I hope I will be able to visit Debbie and enjoy some longer hikes this summer. I wish it wasn't so far...about two and half hours, just far enough to keep me from being able to go every weekend. We enjoyed a cool down walk around the lake, ate at Ruby Tuesday's and I headed home...wishing I lived closer so I could enjoy the trails in Blue Ridge more often. How close are amazing trails to you? Do you have any favorite trail or hiking spots? How was your weekend? In general I am a smaller built person, 5'2" with hips a little shy of 38 inches. Sadly, I have always been fairly thick through my shoulders and chest too so I am just straight up and down, no kind of curves going on at all. I have always felt I would look a whole lot more balanced with hips a few inches wider. I am hoping to hike Sunday or Monday- still trying to finalize plans, but I got my outfit! The Blue Ridge Mountains are about a two hour ride. Hopefully, I will have some pretty views to share. This morning's run was with a friend from work on a trail I have never visited before. It was about a half hour drive, and very pretty with lots of shade and turtles, but my body wasn't cooperating much today. I did order a gymboss so I will have a timer soon so I can work on my Galloway method long run and see how I do. My long weekend plans aren't very exciting, how are yours? Do you drive often to get to a place to run or do you mostly run out your front door? Foam Roll or Stick Roll? At least it's pretty dark at 5 a.m.
Second, I have never foam rolled. I hear all these positive things, but the giant foam roller always looks a little overwhelming to me. I do ice, take ibuprofen, and stretch a lot, but no rolling. I am leaning toward buying the stick. It looks a little easier to use in different positions. If you have an opinion or suggestion about the foam roller verses the stick roller, please fire away! I'm open. My odd sore spot on my calf was feeling great after my seven mile run Monday, but tonight on the treadmill I could feel the little tug again. I just ran three miles on the treadmill and then did my weight training. It isn't as sore as last week though. I will probably have rest days Thursday and Friday because my hubby is off, that should clear it up, right!? but BooBoo was waiting for me and he's so sweet, he just makes me smile. All my cats are indoor babies, expect BooBoo, who was a neighborhood stray, and when Hurricane Sandy blew through my hubby let him inside and now we can't let go of him. Before we let BooBoo in my hubby would sneak him food. We had too many pets already, so I tried to insist we take in no more...but my hubby doesn't listen to me. BooBoo hanging on screens trying to get someone's attention. BooBoo loves to mess with my other cats. He walks out the front door, goes around the house just to sit at the back door and cry, until I let him in. We play this game all night, every night...LOL Who has who trained?! Someone please tell me you rolled out of bed and ran in pj's at least once?! If you have an opinion or suggestion about foam roller verses stick, please fire away! I'm open. Do your pets think humans only exist to serve their needs too? Run Buddy got a gym boss and started trying out the Galloway 4 X 1 method. I was a total skeptic, but I told her I'd give it a try. Am I going to run fast enough to still have a decent pace? Will it feel like a regular run or less of a work out? How can walking be good for me when I want my body to run? Total skeptic, that's me...Kasey has been enjoying it though, so I was willing to try. So off we went at 7 p.m. on a Monday evening. At first I had a time trying to gauge how hard to run, how long four minutes was going to feel, and about the third walk break in what I feared happened...I heard the gym boss beep and I did not want to run. I was really enjoying walking, it sure is a lot easier than running, but that's why it's good to try with a friend...Kasey had the beeper on her side so I had to go. I pushed my mental whining aside and started running again. That was truly the only moment I had that feeling. A few miles in the rhythm started to feel easier and it became really easy to guesstimate how much to push and when to relax. The four to one is a very smooth rhythm to get used to. I loved that I could plan which sets I was going to take it easy on and which sets to hit it a little harder. Toward the end at mile six I hit my best sprint, because by then the sun was about down and in case you haven't heard me whine enough about sun and heat, I have a little aversion to the sun and once it went down I felt fabulous. We did get extremely blessed with a very cool, low humidity evening here in VA tonight, so our test run was in near perfect conditions, but I feel confident this would help me survive longer runs this summer for sure. I never dreamed I would enjoy the workout as much as I did. I felt like I could have run a bunch more miles pretty easily. I really think this would be a great method to use to run the Princess Half if we make it in this year. It would be easy to stay together this way and still get a great workout. I don't think I will use this for every run, but I am excited to try it on a double digit run and see if I can blow past that 10 mile wall I always seem to hit. 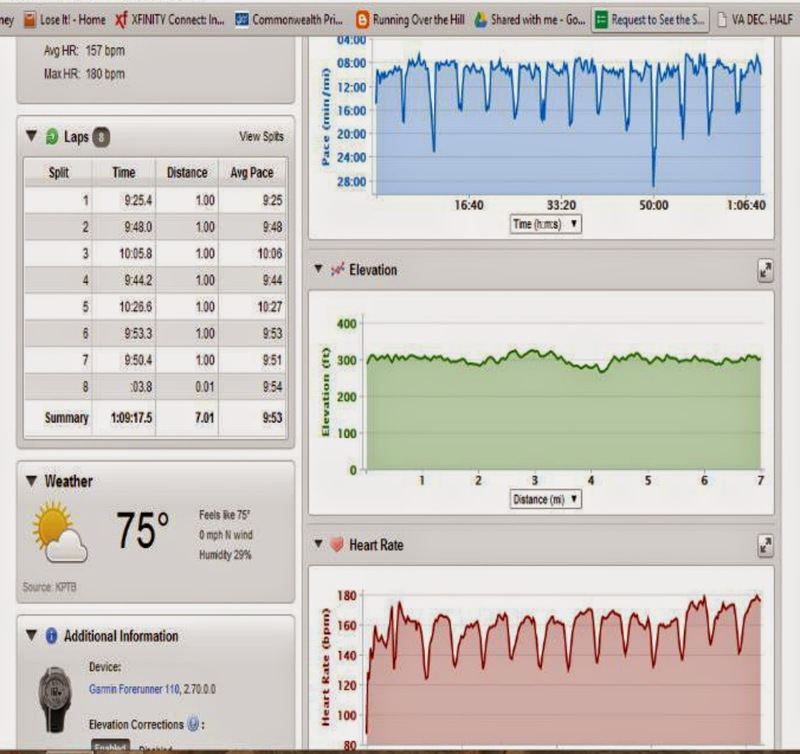 Looking through my stats on 7 mile runs this is actually a really good run. I have a few I ran right at 1:08 this winter but I have a bunch from last summer that took as long as 1:11 and 1:12. Since I wear a heart monitor I compared calorie burns also...most of my 7 mile runs average between 660 - 680, my Garmin calculated this to be 625, but honestly because of the speed work I think my muscles got a great workout and I feel like that little bit is nothing to worry about. 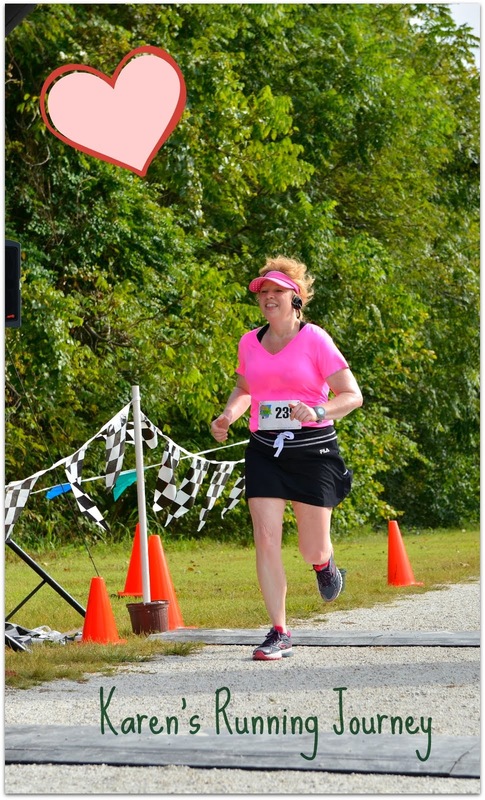 All I can say is thank goodness run buddy makes me try new stuff ") I would not have executed this as well on my own. Have you ever tried the Galloway method? Skeptic or believer? Do you think I am creating a bad habit by taking a walk break? I have spent a few weeks with very little sleep worrying about my work situation so finally this past week I decided to accept a new position back in an elementary office as an enrollment secretary/grade quick manager. My contract for my current position ends June 30th and I am hopeful the change will be good for me emotionally. This past year I was dealing with a lot of changes and most were for the worst. It's been a pretty totalitarianism kind of environment and I just don't understand folks who seem to delight in making every procedure more complicated and tedious than it need be. Enough of that rant...but yes, I am extremely hurt and it will take awhile to get over this past year. My left shoulder had a super sore spot last weekend, so I decided to load the anti-inflammatory on a regular regimen and rest a few days from upper body weight training. I needed to beef up the running and the beginning of the week called for temps 96 degrees and above. I tried running Monday and Wednesday morning at 5:00 a.m. and wow was that challenging...Monday night I ran after work and did a few miles at a time, with a walk break in between. Thursday I finally felt no soreness so I went to the gym and got in a decent upper body weight session and felt great, so hopefully whatever was irritated in there will stop being cranky. I actually dusted the cob webs off my elliptical in my garage and did 25 minutes on it instead of running that night because it was pouring rain and I just didn't feel like treadmill running. I also have a spot on my left calf that keeps getting irritated when I run. 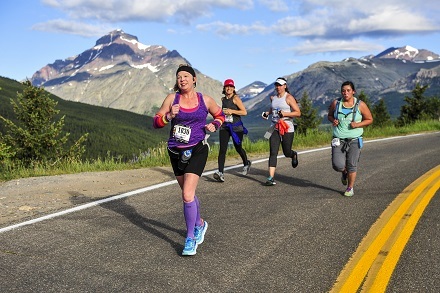 I have been living in compression socks when I am not running, and it felt better when I was on my regimen of Diclofenac Sodium earlier this week, but the irritation returned after Saturdays 10K. Sunday morning I did my trail loop and I felt pretty good until the last mile, then the tugging in that one little spot on my calf that's making me crazy started. I pleasantly surprised the trails were somewhat cleared, they must have run a tractor through and moved the leaves. There was a mud obstacle run there last weekend so I guess they spruced things up for it. Bonus for me, I can see the tree roots :) I did encounter a few spots that were still pretty muddy though, and got really grubby by the time I finished the loop. 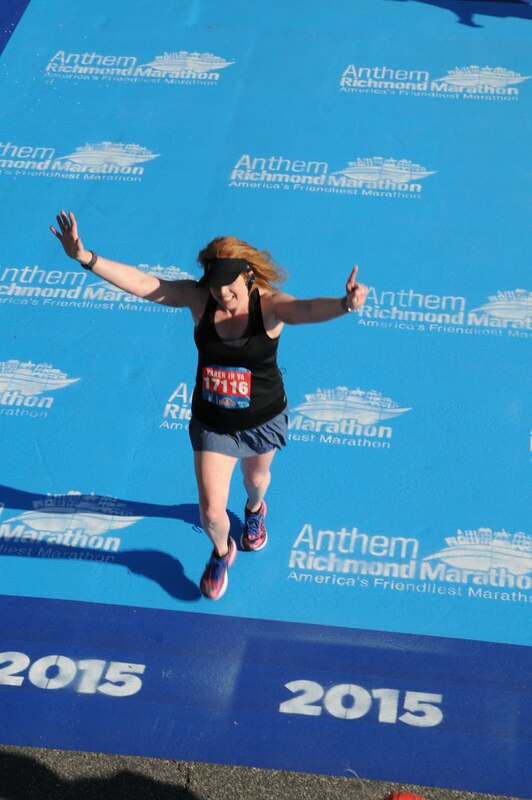 May 3rd was my last long run, a 10 miler, and I am starting to worry my body has forgotten how to survive a long run. I want my calf to heal up though, so I may hit the weights hard and take a few days off from running this coming week. Cheers to trying to survive and not end up injured. Tell me anything you want! Ever changed jobs because of your own personal misery? or tried to change your workout routine? time of day? loved or hated it? Kasey purchased the vests so we would have something super cool to illuminate us during our glow run. 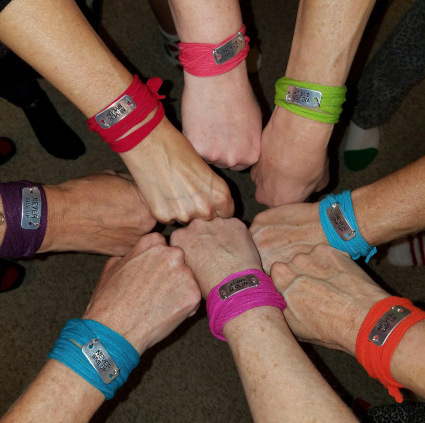 She also thought by increasing our visibility we would have some safer options for super early or evening runs trying to survive the summer heat. 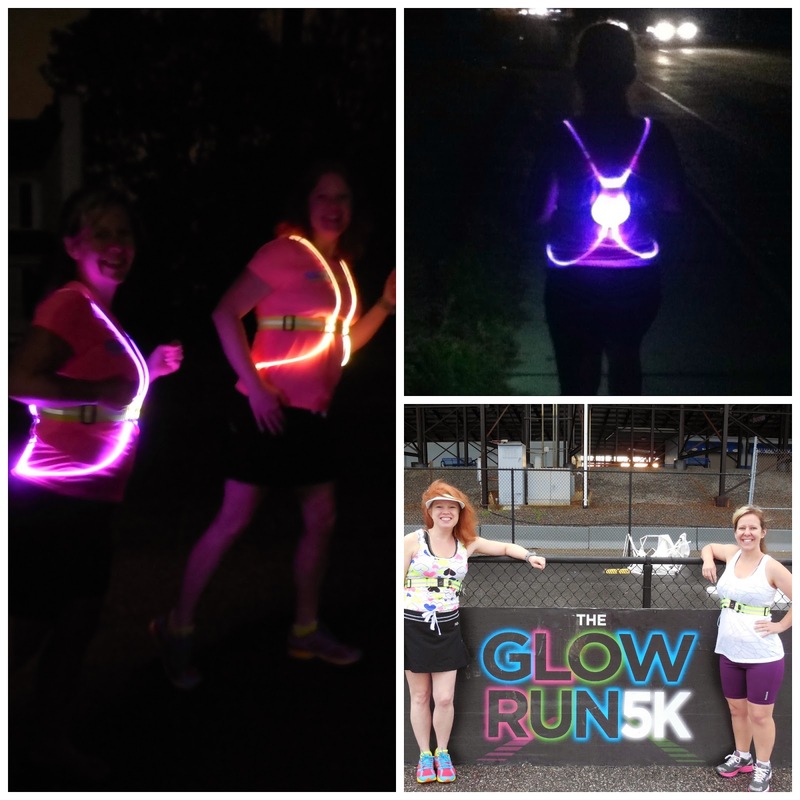 Ultimately our Glow Run post (you can see a few more pics here) was canceled, but we picked our own route and tested out the Noxgear Tracer 360. 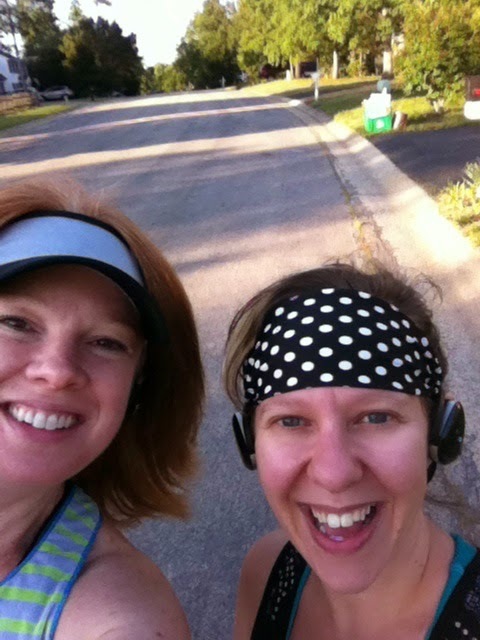 We ran a hilly 3.6 miles for our test run. The vest is actually just a soft nylon strap with very thin cords. We are both wearing the small size. It expands and tightens very easily and the strap is very flexible and comfy. There are little black squeeze buttons to adjust the shoulder straps. Initially, before I tried it on, I was worried about how fragile the cords felt and wondered if they would stay securely in place. 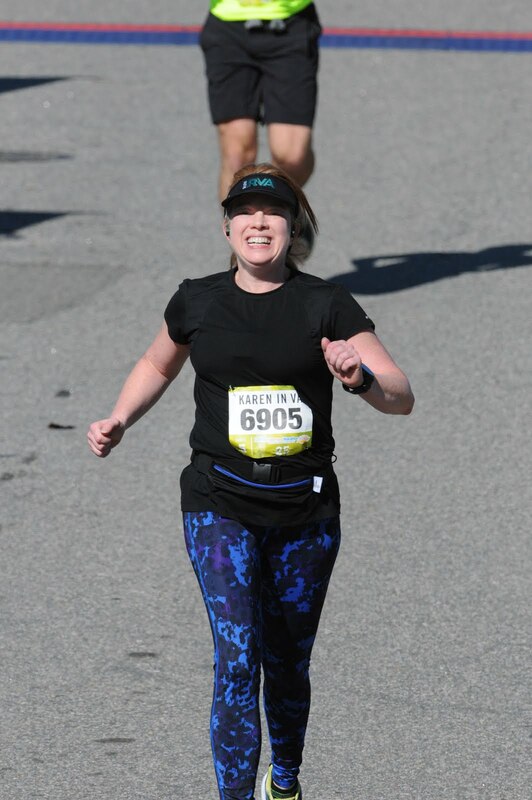 I was pleasantly surprised, once I got the cords adjusted snugly they stayed in place on my shoulders for the full 35 minutes we were running. A few minutes into running I realized the cords, although thin, are plenty sturdy. No bouncing pieces, no need to adjust anything, we both felt like we forgot we had it on. I loved all the color settings, including the options that pulse and flash. This would be a fabulous vest for cyclists who want to be seen - the pack in the back is very lucid. I would recommend this to anyone looking for a way to be more visible without getting irritated by extra weight. Noxgear gets 5 ★★★★★ :) from me. Comment me if you have any questions or thoughts. What's Not Fun About Glowing? !